I am trying to search my bash history similarly as with CTRL-r, but to forward direction. It has been a pain for me, when I just hit once too often CTRL-r, to find the previous command again. How can you forward search your Bash history similarly as in reverse searching? To search backward in the history for a particular string, type C-r. Typing C-s searches forward through the history. I usually press ESC in terminal, and then the '>'. It resets at least and then you could try click less too often CTRL+R. Not the answer you're looking for? Browse other questions tagged bash search or ask your own question. How to reverse-i-search back and forth? 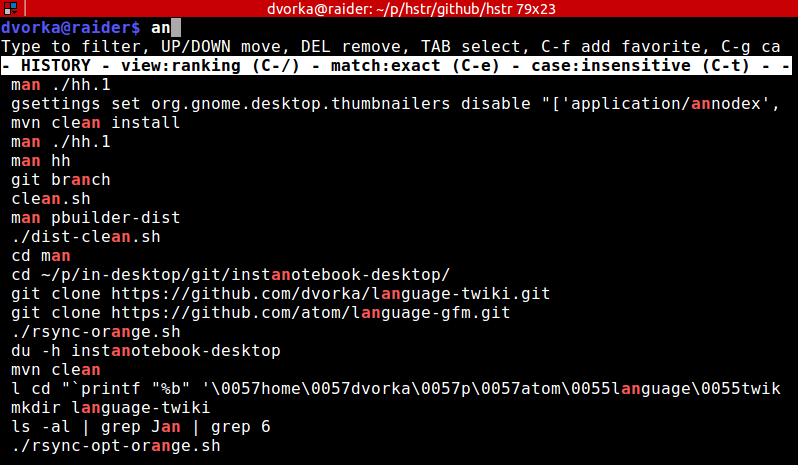 Control-r reverse-i-search in bash: how do you “reset” the search in Cygwin? Why doesn't “map! <C-q> :q <CR> ” work in vim? What is your single most favorite command-line trick using Bash? How do you search through vim's command history?